Kid Kool. Psycho Fox. Magical Hat no Buttobi Tabo! Daibōken. DecapAttack. Four titles which, at first glance, seemingly have nothing in common, yet when playing, feel like part of the same series. That’s because they were all developed by Vic Tokai, in conjunction with a small company called Seibu Lease, and shared many of the basic staff. (The enigmatic credits of these games point only to fellows like “Dark Side Toshi” and such.) They are all side-scroller platformers, as were common for the era, with an inertia-based physics system. It’s also interesting to see how the concept evolved from barely unplayable garbage (Kid Kool) all the way up to a minor classic (DecapAttack). 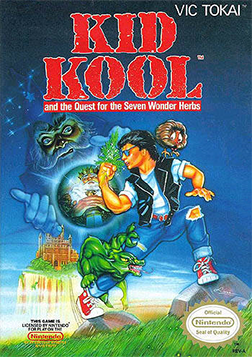 Kid Kool was published by Vic Tokai for the Nintendo Entertainment System, while Sega published the remaining three, with Psycho Fox on the Sega Master System, and Magical Hat and DecapAttack (themselves almost the same game) for the Mega Drive/Genesis. 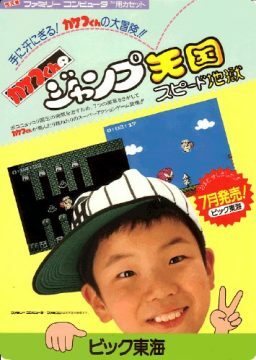 In the Japanese version of this title, you take on the role of Kakefu-kun (AKA Kenji Sagara), a real life child television star from the mid-80s who grew up to be a convenience store manager. 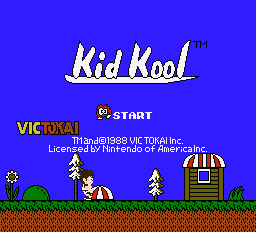 In the American version, his hair was changed to look more radical (the same thing done to Kid Niki) and renamed Kid Kool. The quest is largely the same – the king of the kingdom is ill, and it’s up to the hero to charge through seven different worlds (with three sub levels each) to find the herbs that will cure him. The game is obviously based on Super Mario Bros. to an extent, with a much heavier emphasis on building inertia. In Nintendo’s game, your jumping distance depended on whether you were running, walking, or standing still. Here, the concept is the same, but the effects are wildly exaggerated. If you jumping while still (or slowly walking), you leap will be so short as to be fundamentally useless. If you’ve built up enough speed, you’ll send yourself flying through the air. (There’s a reason the Japanese title translates as “Jump Heaven, Speed Hell”.) There is almost no middle ground, and most of the game is spent wildly struggling with the controls, a death knell for a platformer. It also doesn’t help that, in many cases, the game does expect you to make wild, blind leaps, which will always have a good chance of sending you careening straight into an enemy or down into a pit. 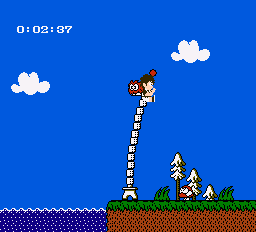 Unlike the original Super Mario Bros., the levels have some verticality to them. However, likely due to the technical restraints of the NES in regards to scrolling, jumping between screens requires a flip scroll, which is entirely too disorienting. It also doesn’t help that you can’t run backwards, making it difficult to build up the speed that you need for some longer and higher jumps. Your kid is mostly defenseless, except with the ability to (of course) jump on enemy heads. A single hop won’t kill them, but will instead will squish them into the ground, disabling them temporarily. A second hop will do them in. Hidden behind certain bushes, you’ll also find a little furry thing with gigantic eyes, which will then perch atop your shoulder. This can be thrown at enemies, which bounces at an awkward arc, sits on the ground for a few seconds, and then returns like a boomerang. Normally you are killed with a single hit, but if you have this guy, he’ll absorb the damage instead and fall away. 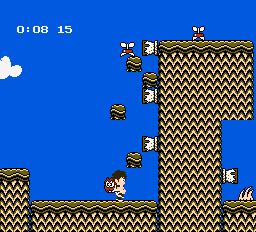 The game is also filled with numerous, annoying obstacles. 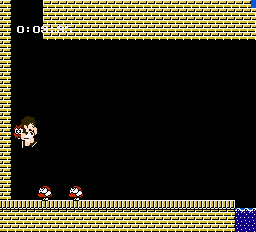 There are invisible bonus bricks which, when hit with your head, will give you a chance for a bonus game at the end of the level. Too bad they’re usually positioned in spots where you’ll accidentally hit them, screwing up your jump and getting yourself killed. Even more annoying are the wind-shooting jars, which can push you in any direction and don’t seem to have any pattern beyond randomness, so trying to ride the gusts or fight against them is a matter of tenacity. There are also large poles, which bounce back and forth, and sending you flying various distances depending on where you’ve grappled it. 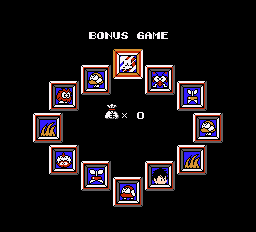 They’re the least annoying aspect of the game, if mostly because if you repeatedly land on the top, you’re rewarded with extra lives. There are also a few points where you need to bounce on water like a skipping stone. All you need to do to initiate this is start running into the water, but you can only hop three times, so need to time your jump at the perfect moment before you sink. At the top of the screen is a timer. The game runs in real time, and cycles from day to dusk to night to dawn and back again, which is a surprisingly cool touch. However, the timer affects your ending as well. If you take too long (where “too long” means “over three hours of real time play”) then the king dies and you get the crappiest ending. For all of the torture the game puts you through, this is a real gut punch. So here is a game that desperately wants to be on the level of Nintendo’s best, but lacks the competence in both programming and design. 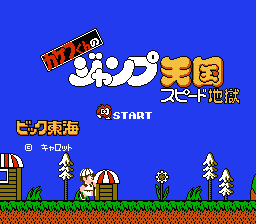 It’s not the worst platformer on the Famicom, because there are indeed ones that are entirely unplayable, but it’s definitely one of the worst that anyone bothered to bring to North America.